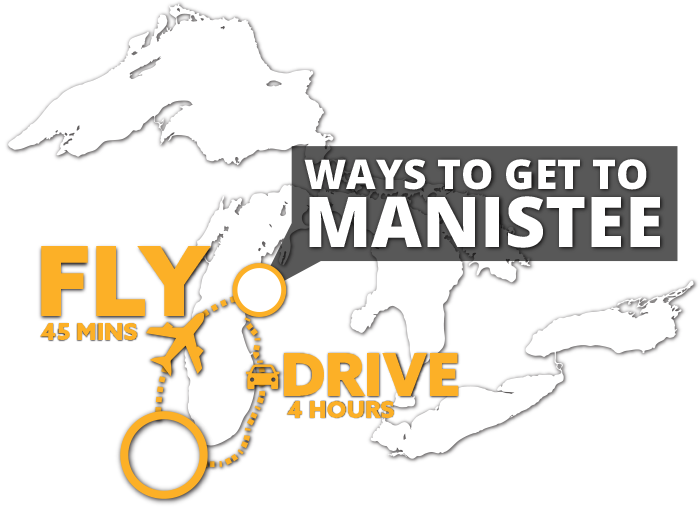 Bring the whole family and enjoy the 4 rivers in Manistee County. HOW DO YOU WANT TO PADDLE? Bring your own boat, or rent from one of our liveries and explore one of our 4 awesome rivers. Read about each one, find your match, and let’s go on a river vacation! With a little bit of White Water! 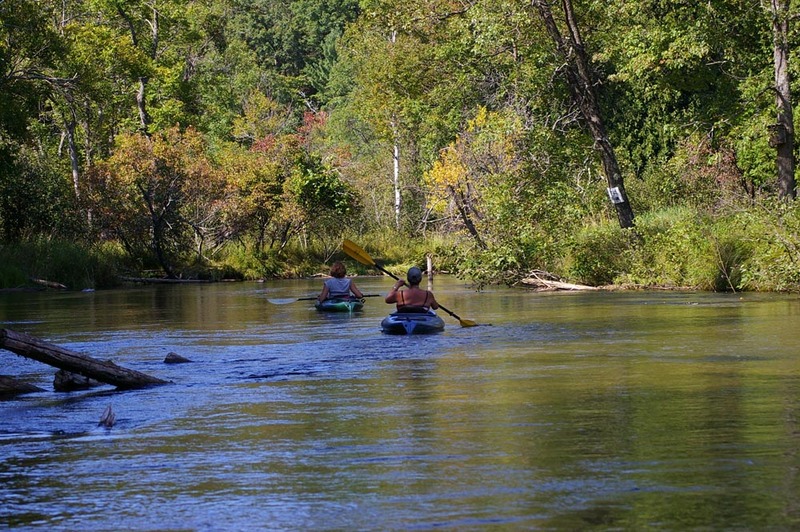 Blessing the southeast corner of Manistee County, the Pine River is one of Michigan’s top recreational rivers. While the current varies on different stretches, the awe-inspiring beauty is a constant. Meandering through miles of National and State Forest, you can experience the undeveloped riverscape and deep river valley on a stretch of lower-gradient, mild current, or opt to go for the gusto on a more spirited stretch of river enjoying the Class I rapids for which the Pine is famous. Facilitating full-tilt family-fun on the magic of the Manistee and Pine, Michigan’s premiere paddlesport rivers. From rafts to SUP’s, canoes and kayaks, we are uniquely positioned to fit you to craft that are both size and experience appropriate. The Big Manistee River is wide, and smooth flowing with no rapids or tight corners to navigate. Much of the river is about 2-5’ deep with a few deeper spots at the switch-backs. IDEAL TRIPS: Two ideal trips on the Big Manistee River are Hodenpyl Dam down to Red Bridge, and Tippy Dam to High Bridge. These are perfect for families with kids and large groups on kayaks, canoes, rafts or tubes. These stretches also offer plenty of sand bars, so you and your group can get out and stretch your legs. If you want to spend an entire day on the water, continue from High Bridge to Bear Creek. 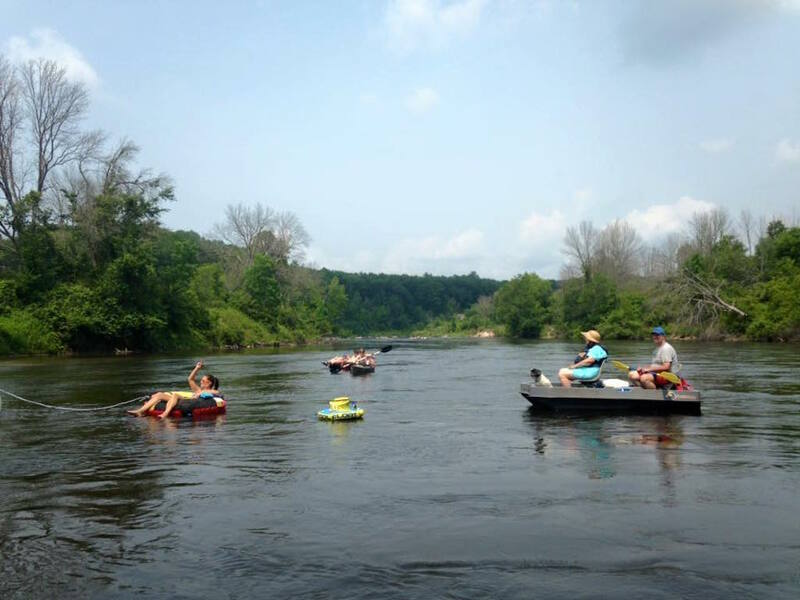 Offering family oriented Canoe, Kayak, & Tube trips on the lower section of the Big Manistee River and more challenging Canoe & Kayak trips on the Little Manistee River. Big Manistee River floats north of the Hodenpyl Dam by canoe, kayak, raft or tube for beginners or experienced. Two- to five-hour trips, daily or overnight up to 7 days. Sand bars, wildlife sanctuary, picnic and camping areas on the River’s beautiful, ever-changing landscape. Build your own trip. Hodenpyl Dam to Red Bridge trips not available at this time. The Little Manistee River is a much smaller river when you compare it to the Big Manistee, but we still consider it an easy to moderate river to paddle depending on which section you choose. Intermediate paddlers and beginners who are feeling adventurous will enjoy 6 Mile or 9 Mile Bridge down to the weir. The higher on the river you go, the more difficult. The river is narrow and will require some tight turns. It isn’t too deep though averaging 1-3’ so you can always get out if you need to. The Betsie River, found on the northern edge of the County, is ideal for beginner to intermediate paddlers looking for a relaxing float. The current is smooth, but upper portions of the river offer tight switch backs and some downed obstacles to navigate. You can also rent a canoe or kayak at Crystal Adventures. ATV, Kayak and Snowmobile rentals. 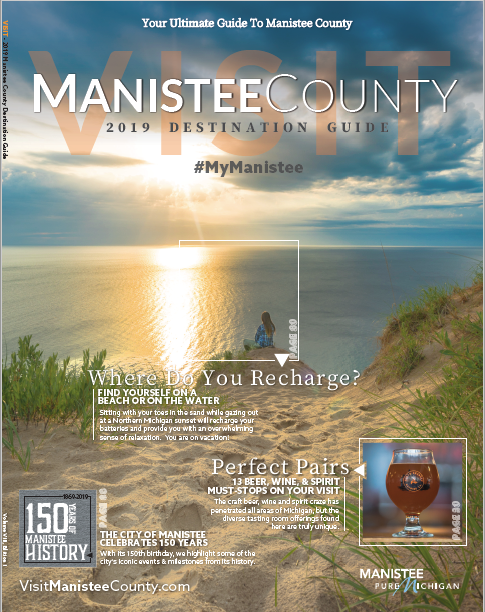 Paddle the Betsie River, ride the beautiful, groomed Manistee/Benzie trails, Park & Ride/Sled & Bed lodging packages available. When people come up north for vacation, they often bring one vehicle with the whole family. With that, you lose the second car for staging a vehicle on a river. No problem, bring your boats and drop-in where you don’t need to stage a vehicle and worry about getting from point ‘A’ to point ‘B’ on any schedule. 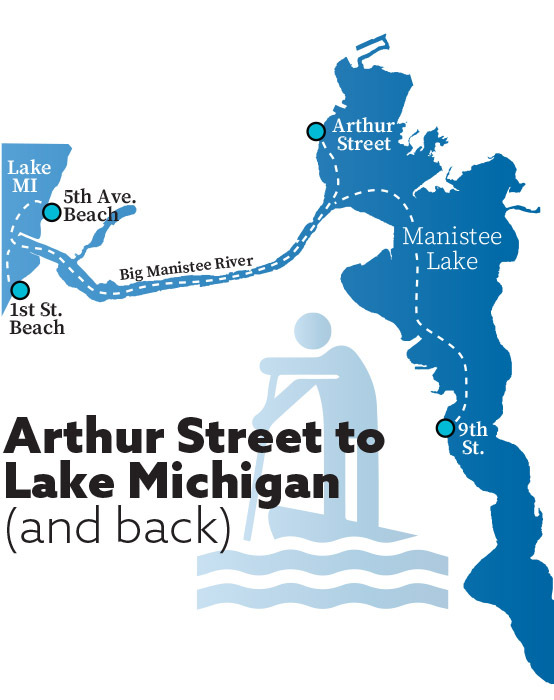 The Manistee Lake to Lake Michigan Paddle: The paddle is easy, as the river is fairly wide and free flowing – however, if the wind kicks up, it will make you work a little harder to get to Lake Michigan or back to the Manistee Lake depending on the direction. If you are lucky, you will also catch a freighter moving through the channel, or the sounds of a free Roots on the River concert. 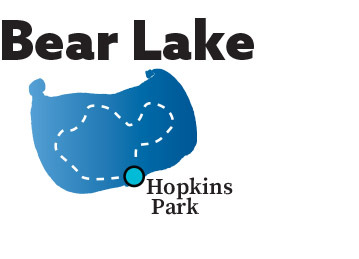 Bear Lake offers a great launch at Hopkins Park where you can rent watercraft at Bear Lake Marine (next door). Also enjoy their music on the water summer concert series. 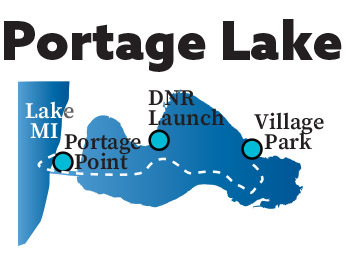 Portage Lake has two launch sites where you can enjoy a paddle in the lake to Lake Michigan and also stop at Lahey’s Pub at the Portage Point Resort. You can also rent a SUP or kayak from Papa J’s. 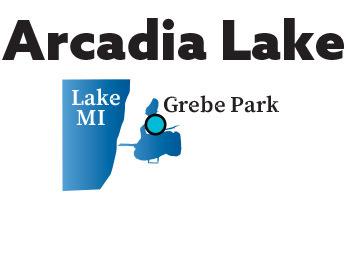 Arcadia Lake has an ADA launch site with access to the Arcadia Marsh and Shipwreck sites along the shores of Lake Michigan.